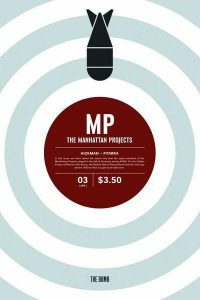 In The Manhattan Projects, we get an alternate history take on the famed program that brought us the atomic bomb and helped ensure an Allied victory in World War II. In this reality, Robert Oppenheimer is really his evil twin, Einstein is a bit of a drunk, and Wernher von Braun has a robot arm. With these men and the leadership of Leslie Groves, the US conducts the secretive Manhattan Projects, hoping to bring about the atomic bomb, and other, more sinister projects. We start off the issue with Feynman entering Einstein’s room, asking for his help with “the bomb”. Einstein sits there, staring at his monolith, initially saying that he’s too busy to help. When Feynman says the problem is that they can’t agree on a design, Einstein suggests first very quietly, and then again more loudly, that they build both designs. We then cut to a flashback from Leslie Groves’ childhood of a talk he once had with his father regarding a Bible verse and the fear of the righteous. Leslie learns that day that from his father that “no one exceeds the reach of the righteous”, a sentiment that comes into play later in the book. We then cut back to the present day where Fermi and Daghlian enter a room filled with radioactive material, which we learn is responsible for Daghlian’s current situation. As the two converse, Fermi expresses the sentiment that everything ends. Fitting with the sentiment Fermi expressed, Franklin D. Roosevelt is shown as having died. In a hurry, Truman is taken from a Masonic ritual and quickly sworn in as president. Shortly after, Daghlian is given the dead body of Roosevelt. Rushing into an operating room, they seek not to revive the dead man, but turn him into something else entirely. At this same time, Oppenheimer is meeting with Truman, attempting to brief him on the secretive undertakings that the Manhattan Projects have been involved in. Foremost amongst these is the construction of the atomic bomb. As he’s being debriefed, halfway around the world, a bombing run is being made, and Truman has to give the word on rather or not to drop a bomb that he’s just learned about. With this new information, Truman makes the call not to deploy the bomb, but Groves does it anyway, citing that “no one exceeds the reach of the righteous”. At the same time Daghlian is successful in making the world’s first artificial intelligence, that of Franklin Delano Roosevelt, currently hooked up to a stock ticker. As always, the art is a joy to look at. Nick Pitarra does a wonderful job with facial expressions and tiny details of clothing and backgrounds. My personal favorite panel was one in Einstein’s room where his tables are littered with random things. Toys, statues, trunks, and other things litter his room and the detail on these background pieces is a nice touch. The radiation around Daghlian’s head is also something nice to behold and Pitarra draws it well. Overall, the art is great. Jonathan Hickman’s writing and characterization is wonderful as well. With such great alternate takes on different historical figures, Jonathan Hickman does wonders with the story. Having Einstein as something of a brooding drunk, Oppenheimer as a schizophrenic, yet somewhat reserved lunatic, and von Braun as a bionic man, is just wonderful to behold, and bit of focus on Daghlian this issue was nice to see also. In the previous issues, he had been introduced, but never really expounded upon, and now he has been. Overall, the writing of the issue was great, and made an enjoyable read. Another great issue that satisfies a fan of alternate history. Definitely a series to be reading. This is one series I wished I had picked up from the beginning. I’m a big fan of reimaginings of historical events. Great review! This book sounds pretty sweet. I love almost anything about that time period. I’m a big fan of alternate history, so this series was one I was definitely checking out. The way they do it is just great, and it’s definitely a series to watch.